The arrival of WHAT PET SHOULD I GET? by Dr. Seuss marks a truly historical moment in children’s publishing. Discovered in a box that had been packed away, this long-lost Dr. Seuss treasure (believed to have been written in the late 1950s) is something patrons of all ages will want to take home—and of course, listen to on audiobook, as read by Rainn Wilson. 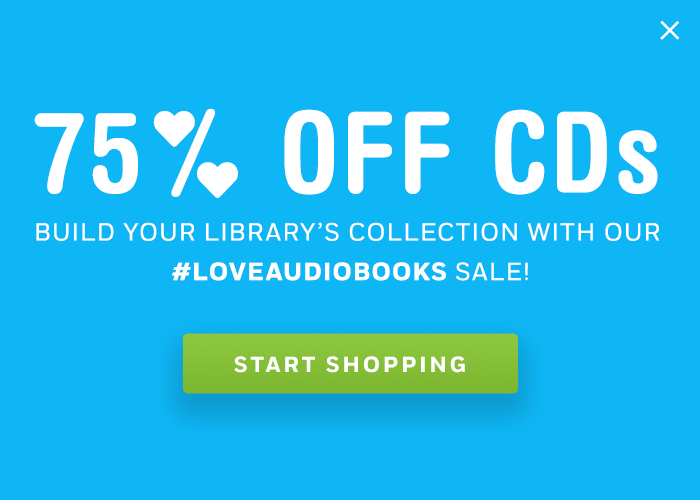 Learn more about this new book and listen to a clip here. Trademark and (c) Dr. Seuss Enterprises, L.P. All Rights Reserved. So the BOT team looked in our own packed-away boxes, through closets, photo albums, behind refrigerator magnets (you know…here and there and everywhere!) 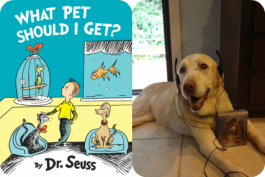 in order to share some long-lost treasures of our own and celebrate the pets we picked, the pets we longed for…and the pets who were as much a part of our childhood as…well, Dr. Seuss! Dr. Seuss sure knew how kids think. I wanted a pet. I WANTED a pet. Although unlike the indecisive siblings in the book, I knew exactly what kind of pet I would get. Too bad I didn’t have this new Seuss book to add as an illustrated hint-hint alongside my cute—if not slightly, desperate!— letter about my desire for a dog! But don’t feel too bad for my puppy-preoccupied pre-teen self…while this note was not as helpful as I hoped, I did eventually get the pet I always wanted…albeit about seven years later. 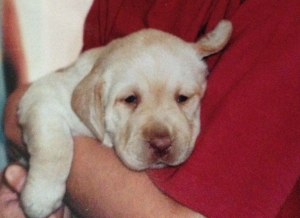 Daisy was the perfect pup in every way. 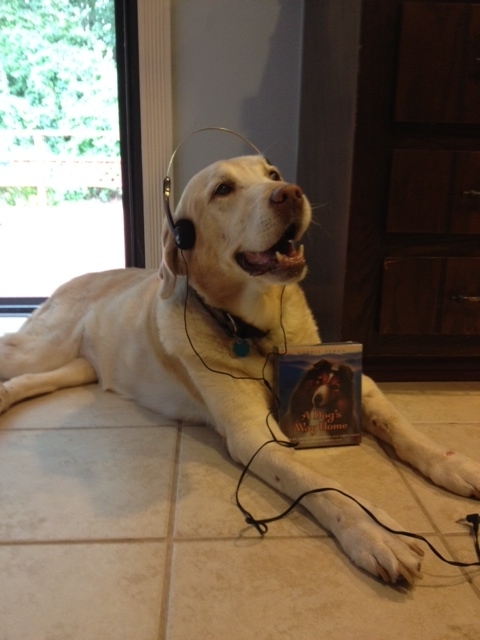 She even grew up to be a fan of audiobooks! 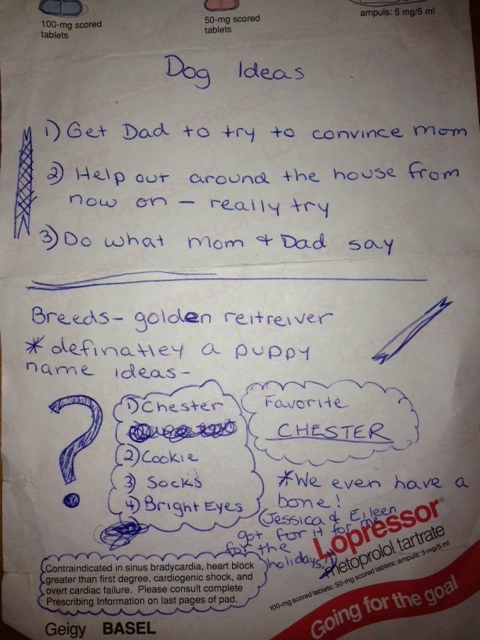 Funny fact: Chester was my favorite name when I wrote that note…and it turns out, my husband Evan had a dog named Chester when he was a kid! Canine coincidence? From early days, I had pets, a lot of pets…cats, dogs, hamsters, snakes, newts, insects, even a baby squirrel. My parents quickly recognized my love of nature and all creatures, big and small. 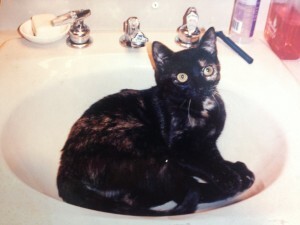 I couldn’t find a picture of my first pet, a beta fish named Blue, but I would like to share stories of two of my favorites – a cat named Olivia Del Rey and a hamster named Fizzgig. 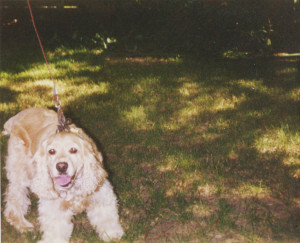 Olivia Del Rey was my first pet post-college. She was named after an 80-year-old lounge singer, who sang Jazz and Blues standards at a hotel bar on the Williams College campus. Although Olive’s special talent wasn’t singing, she did have a unique way of getting your attention and being affectionate. She jumped or climbed up then tenderly patted your shoulder. Olive also sat while I read or watched TV with her front paw rested on my shoulder or neck, purring constantly. I never felt alone with her close by. 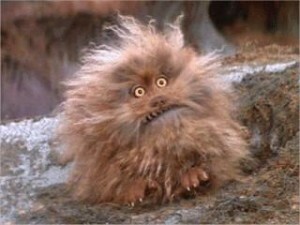 Fizzgig was named after the fantastic creature from The Dark Crystal. He wasn’t quite as hairy but he was an extra poufy teddy bear hamster. His special talent—he had a way of charming people. During a cross country drive—actually, I was relocating from Brooklyn, NY to Belmont Shores, CA—I let Fizzgig out of his cage occasionally to walk on the dashboard or climb on my shoulder. This coincided with me getting pulled over by a police officer for speeding. In the excitement, I forgot to put Fizzgig back in his cage. Well, lucky for me, Fizzgig enchanted the officer, who let me go ticket free. What can I say – PETS RULE! Emily Parliman, Assistant Acquisitions Editor: A green thumb paw? Our dog Barney used to “help” us garden. We would plant a bulb, and then he would enthusiastically go over and dig a hole in the exact same spot. 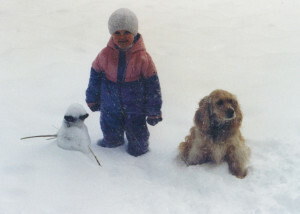 A true canine companion all year-round: That’s little Emily with Barney on a snowy day! Did he “help” build a snowman, too? Aaron Blank, Executive Producer: Don’t disrupt Cowboy’s catnap! Sometimes my stepmother would call the house phone from work to leave herself a reminder voicemail. 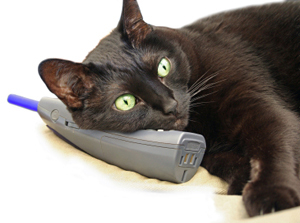 Her cat Cowboy was a very inquisitive animal—so much so that one time when my stepmother called, Cowboy decided to answer the phone. It was one of those clamshell/princess type phones and as best we could guess it was making an irritating noise that Cowboy felt he should make stop. My stepmother deduced what had happened, said “Cowboy?”, and promptly got a “meow” back! Tagged: BOT staff stories, Dr. Seuss, photos, Rainn Wilson, WHAT PET SHOULD I GET?